Hope you enjoyed all the yummy caramel! 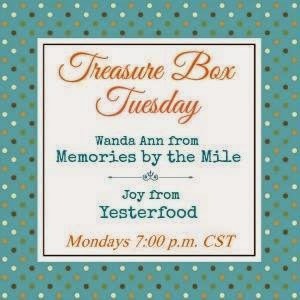 Be sure to join us this evening for Treasure Box Tuesday for more amazing talent from our blogger friends! Thank you for including my Pumpkin Muffins, Joy ! Yum! Those look amazing! I'm pinning this for later! I shared a recipe on my blog today too. Happy Monday! Truly thank you for sharing my Apple Cream Cheese Danish. I love it because it is super simple to make and really delicious. I am thrilled to see Your Most Viewed was Janie's DO YOU WANT MORE BLOG HITS. Her post was so helpful and truly well written. Thanks again for a terrific blog hop. I was reading both post this apple roundup and the Treasure Box Tuesday post. I guess I was drooling so much over all these delicious apple recipes that I wrote the comment above on the wrong post. Anyway, Thanks again for your support and featuring my Caramel Apple Cupcakes. They are super easy to prepare using a cake mix and DELISH! I am serious when I say I forgot what I was doing and where I was at after drooling over this post. Thanks for hosting such a great party and for including my Creamy Peanut Butter Smoothie. I wish you an beautiful day! I am not a big fan of caramel but everything looks so yummy! I think I just gained 5 pounds! Oh my goodness! These look delicious!! Thank you so much for hosting an amazing party, I always love stopping by and seeing all the wonderful recipes that are posted.